I found them together like this. 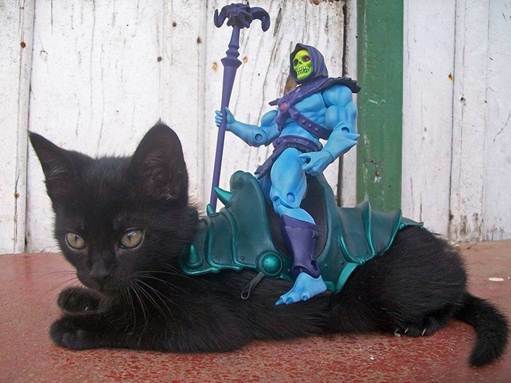 Because sometimes, you just have to share a silly picture. And boldly declaring “Donna Noble has left the library. Donna Noble has been saved.” Oh, I was so proud. Anyway, the other week they tackled the Good Samaritan at school. He understood the story, but didn’t fully understand the significance of the Samaritan’s decision to stop and help the Jew, because the animosity between them hadn’t been explained. Parables are funny like that. The Prodigal Son, for example, is laced with all sorts of detail that escapes a modern audience. 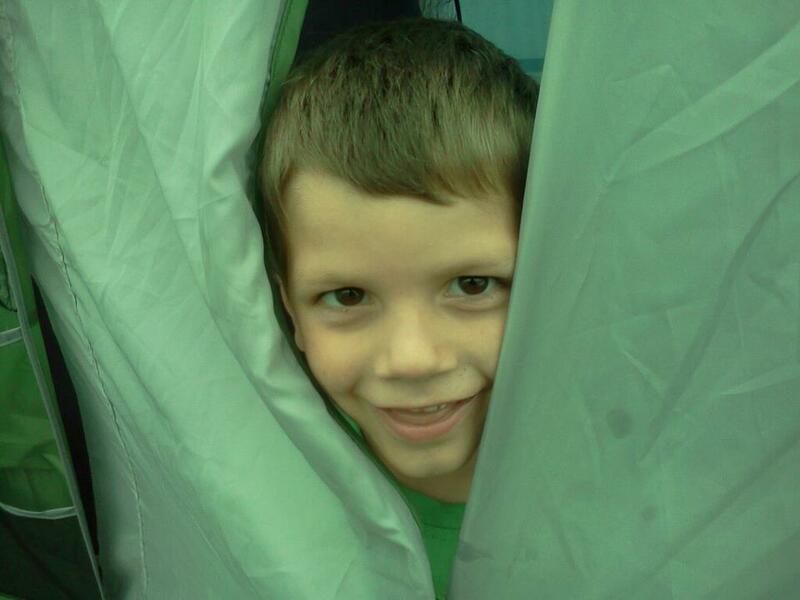 The son’s request for his half of the money was akin to wishing his father dead. Working with pigs would have been beneath contempt for any Jewish man. And when he’s on the way home his father runs along the road to meet him – and never mind the fact that he was filthy and smelled of bacon, running in public was something that no respectable landowner would ever be seen doing. All these details would have been familiar to Jesus’ audience and would have emphasised the point of the story, but over the years a lot of this has been lost. I had thought about doing it that way round. Still, it’s always been my understanding that the Samaritan / Jew disdain was stronger on the Jewish side. Which would mean in turn that the hatred the Daleks have for the Doctor is stronger than any he might have for them – and therefore it makes sense to have the Doctor rescue the Dalek. This does then put you in the unfortunate position of a Jew / Dalek paradigm, which is ironic (and somewhat inappropriate) given the Nazi imagery of ‘Genesis of the Daleks’. 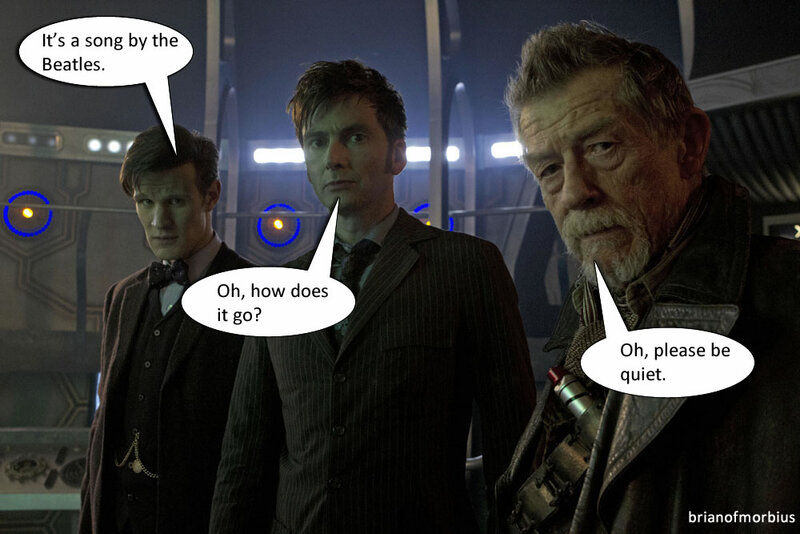 In any event, it seems like Doctor Who has an answer for everything. But I think we already knew that. 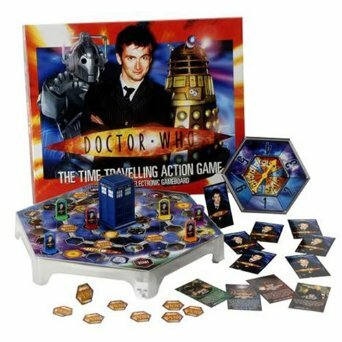 Doctor Who and board games make for strange bedfellows. How can you possibly distil the excitement, the complexity and the sheer variety of the institution into six plastic playing pieces moving over cardboard? How can it possibly translate? It doesn’t, is the short answer. At least not really. 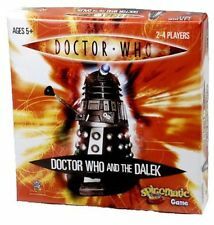 There’s a good reason why charity shops are full of Doctor Who board games but not action figures (just as they’re full of New Who DVDs but rarely the Classic Who adventures). They get given away quite a lot, and one of the great mysteries of the world is why we haven’t yet done this. The Time Lord-related board games in our house are clogging the shelves beneath the intellectual (Scrabble) and the not-so-intellectual (Mouse Trap). They sit unplayed, on display but gathering dust, like those classic books that everyone owns but refuses to read. The first one I got was coincidentally the first post-revival Doctor Who board game produced. 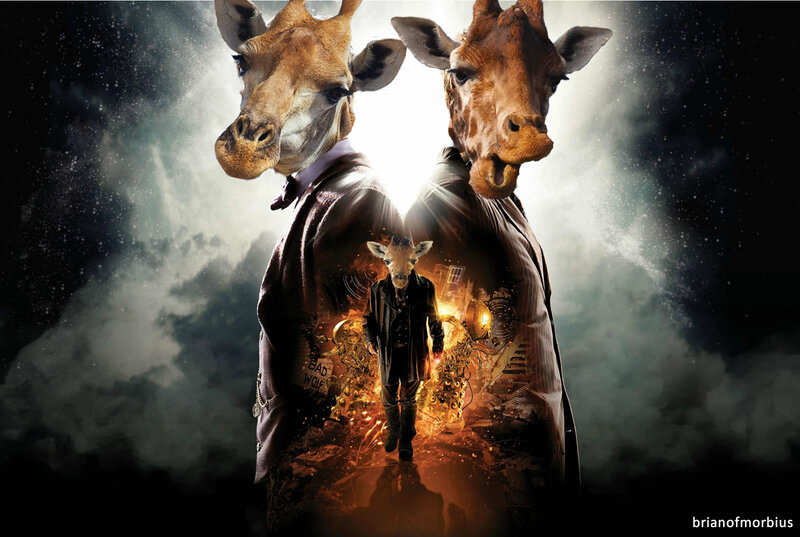 This is the only image I could find, and thus it tells you very little, but suffice to say it’s a derivative of Ludo. 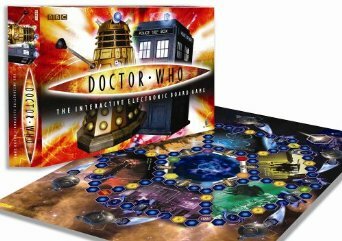 You play the Doctor, Martha, K-9 or Jack, and have the objective of getting all four of your pieces home by travelling round the board. The Dalek patrols the inner, shorter route, and players who would choose a faster alternative to the long haul risk it catching up with them. It’s simple enough to play, although not very interesting. Still, the synthetic playing pieces of Martha possess more screen presence than the character herself ever did, as well as being far less irritating, while the prospect of multiple Doctors would presumably have Jack salivating, or worse. And it is at least quite fun. Both are available from Amazon. I can’t tell you an awful lot about them because we’ve never finished a game of either. They were just too dull, not to mention complicated, with collectible cards and all sorts of back-and-forth trading and giving cards away and getting them back and then pressing the button on top of the TARDIS to get it to make noises. That’s the obvious hook, designed to mask the fact that the game consists of a lot of repetition designed to eke out its length. It’s like a review I read of Aragorn’s Quest, which stated that the developers boasted twenty-odd hours of gameplay, but that eighteen of those would be spent walking from one side of the Shire to the other, carrying mushrooms. 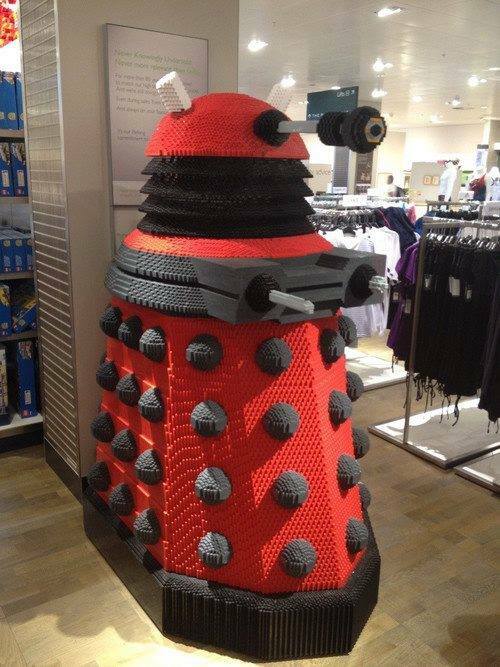 A quick Google tells me that there are alternatives available: derivatives of Risk and Monopoly and Operation (with a Dalek) – presumably Cluedo is on the way (The Professor, in the cavern, with the umbrella). 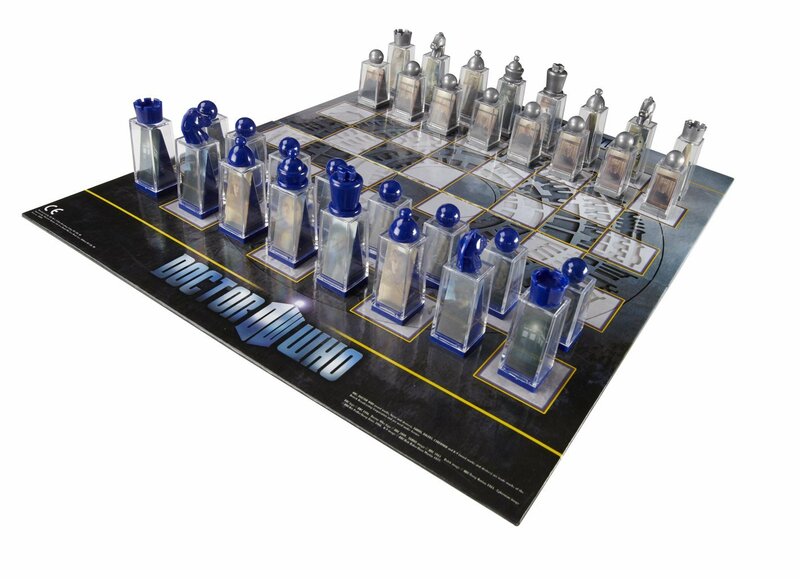 And there’s always chess, a game which always ended well whenever the Doctor played it. Joshua has recently discovered chess, which I see as an opportunity: it would be nice to get a really good Doctor Who set with wooden or metal pieces, the sort you see in glass cases at Hamleys, expensive but not unaffordable, perhaps with the Master playing the black king and Davros as one of the rooks. But as it stands, the only one available that isn’t a handmade collector’s item is this one. I’m not even going to link to it. I mean, look at it. It’s rubbish. Insofar as Who-related chess experiences go, it’s the ‘Nightmare in Silver’ edition. Is the provision of a proper, moulded edition too much to ask? Or is it destined to remain on the wishlist of Never Gonna Happen, along with the Abba reunion, the fourth Back To The Future film or the uncut DVD release of Fire Walk With Me? Anyway, there there is a point to this little ramble, and we shall come to that now. 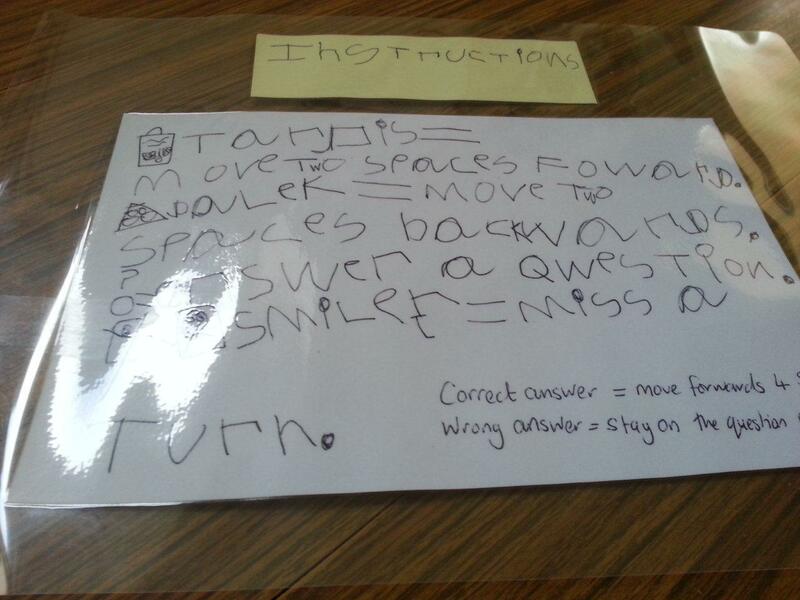 Thomas was off school yesterday because industrial action had closed his classroom for the day. Emily was at a loss for what to do with him, but we found a voluntary homework assignment in his book bag. 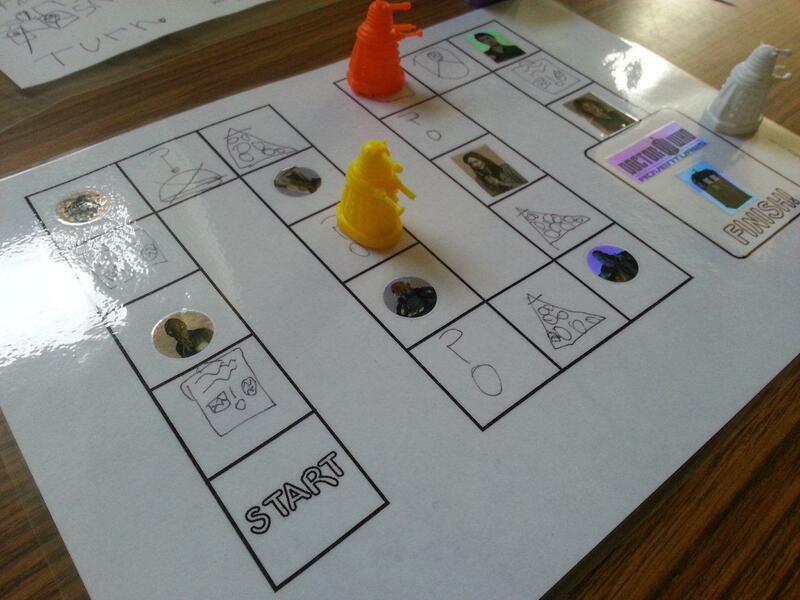 The task was to use some pre-supplied materials to produce a question-based board game. “There’s only one topic of choice, really, isn’t there?” said Em to me. And of course, she was right. So when I got home on Thursday lunchtime, I found they’d done this. And yes, I know the marital status of the Eleventh Doctor is disputed, and the Cybermen aren’t just made of metal. Stop nitpicking. He came up all these himself, you know, along with the general concept. And all this time I assumed that the encyclopaedic accumulation of Doctor Who-related knowledge (not to mention the endless questions) was just for the fun of it. We may not be quite ready for Hasbro, but it passed a morning. I’d call that a win. Thirteen years ago, an old friend – a programmer, musician and one of the smartest people I know – introduced me to the fabulous romp through logic that was Gödel, Escher, Bach. But it was the crab canon that always got me: the concept of a conversation that plays forwards and then backwards, where each line of dialogue acquires new meaning when then preceded by a line that initially followed it. This all sounds rather complicated, so here’s how Hofstadter does it. Tortoise: Good day, Mr. A.
Achilles: Why, same to you. Tortoise: So nice to run into you. Achilles: That echoes my thoughts. Tortoise: And it’s a perfect day for a walk. I think I’ll be walking home soon. Achilles: Oh, really? I guess there’s nothing better for you than walking. Tortoise: Incidentally, you’re looking in fine fettle these days, I must say. Achilles: Thank you very much. Tortoise: Not at all. Here, care for one of my cigars? Achilles: Oh, you are such a philistine. In this area, the Dutch contributions are of markedly inferior taste, don’t you think? Tortoise: I disagree, in this case. But speaking of taste, I finally saw that Crab Canon by your favorite artist, M.C. Escher, in a gallery the other day, and I fully appreciate the beauty and ingenuity with which he made one single theme mesh with itself going both backwards and forwards. But I am afraid I will always feel Bach is superior to Escher. Achilles: I don’t know. But one thing for certain is that I don’t worry about arguments of taste. De gustibus non est disputandum. Achilles: To be precise one has no frets. Achilles: That’s my good friend. He often plays, the fool. But I myself wouldn’t touch a guitar with a ten-foot pole. Crab: Hallo! Hullo! What’s up? What’s new? You see this bump, this from Warsaw – a collosal bear of a man – playing a lute. He was three meters tall, if I’m a day. I mosey on up to the chap, reach skyward and manage to tap him on the knee, saying, “Pardon me, sir, but you are Pole-luting our park with your mazurkas.” But WOW! he had no sense of humor – not a bit, not a wit – and POW! – he lets loose and belts me one, smack in the eye! Were it in my nature, I would crab up a storm, but in the time-honored tradition of my species, I backed off. After all, when we walk forwards, we move backwards. It’s in our genes, you know, turning round and round. That reminds me – I’ve always wondered, “which came first – the Crab or the Gene?” That is to say, “Which came last – the Gene, or the Crab?” I’m always turning things round and round, you know. It’s in our genes, after all. When we walk backwards we move forwards. Ah me, oh my! I must lope along on my merry way – so off I go on such a fine day. Sing “ho!” for the life of a Crab! TATA! Ole! Tortoise: That’s my good friend. He often plays, the fool. But I myself wouldn’t touch a ten-foot Pole with a guitar. Tortoise: To be precise one has no frets. Tortoise: I don’t know. But one thing for certain is that I don’t worry about arguments of taste. Disputandum non est de gustibus. Achilles: I disagree, in this case. But speaking of taste, I finally heard that Crab Canon by your favorite composer, J.S. Bach, in a concert the other day, and I fully appreciate the beauty and ingenuity with which he made one single theme mesh with itself going both backwards and forwards. But I am afraid I will always feel Escher is superior to Bach. Tortoise: Oh, you are such a philistine. In this area, the Dutch contributions are of markedly inferior taste, don’t you think? Achilles: Not at all. Here, care for one of my cigars? Tortoise: Thank you very much. Achilles: Incidentally, you’re looking in fine fettle these days, I must say. Tortoise: Oh, really? I guess there’s nothing better for you than walking. Achilles: And it’s a perfect day for a walk. I think I’ll be walking home soon. Tortoise: That echoes my thoughts. Achilles: So nice to run into you. Tortoise: Why, same to you. Achilles: Good day, Mr. A. The bit with the crab reads like Beckett, presumably on purpose, but the whole thing is brilliantly written, and I marvel upon it today just as I did over a decade ago. “What does this have to do with anything?” you’re asking. Well, in the first instance, yesterday morning I stuck this on my Facebook wall timeline. The end of top posting! > What do we want? > When do we want it? Q. What’s the most annoying thing about usenet forums? I then wondered about Doctor Who – a show which, in its most recent form, has become as obsessed with time travel as a form of narrative as, for example, certain episodes of Red Dwarf. 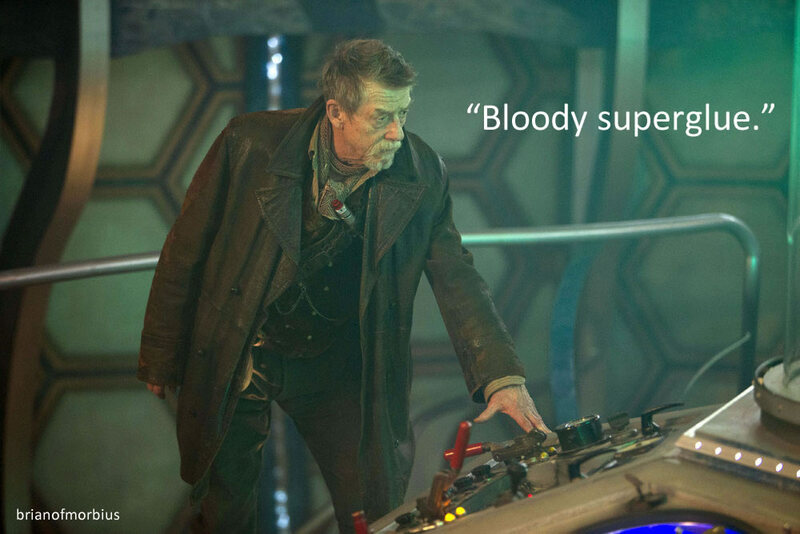 Loops and holes and time-lagged conversations are all part-and-parcel of Moffat’s array of tricks and techniques. Sometimes they work. Sometimes they don’t. The across-the-years conversation in ‘Blink’, for example, as Sally fills in the gaps in the Doctor’s transcript, is absolutely breathtaking. His overuse of ‘Run, you clever boy, and remember’, on the other hand, is a disaster (not least because it’s a recurring phrase that’s different every time we hear it). You have to know when to stop, and Moffat seemingly doesn’t. But that’s OK, because he’s going to bring back the [spoiler] and then the [spoiler], and then [spoiler] will visit [spoiler] and [spoiler]. And that’s just the yellow ones. DOCTOR: And you. Same as ever. Although, have you had work done? DOCTOR: Oh yes, the face. Regeneration. How did you know this was me? 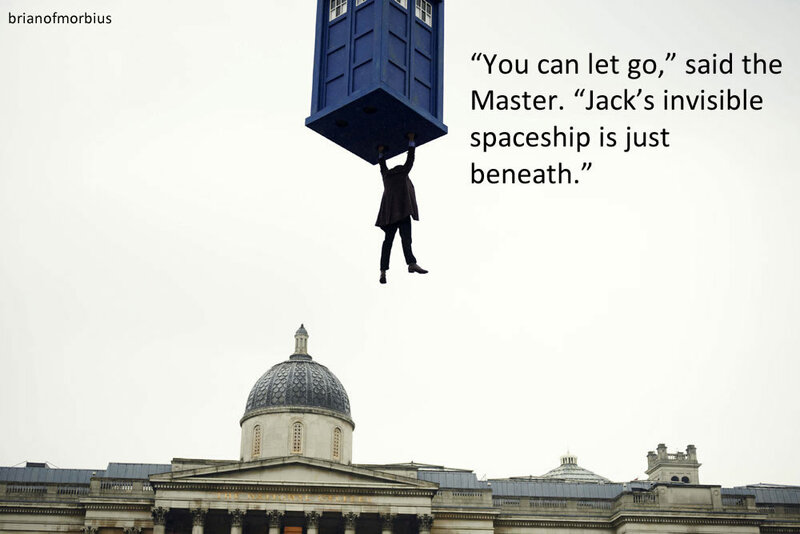 JACK: The police box kind of gives it away. I’ve been following you for a long time. You abandoned me. DOCTOR: Did I? Busy life. Moving on. JACK: Just got to ask. The Battle of Canary Wharf. I saw the list of the dead. 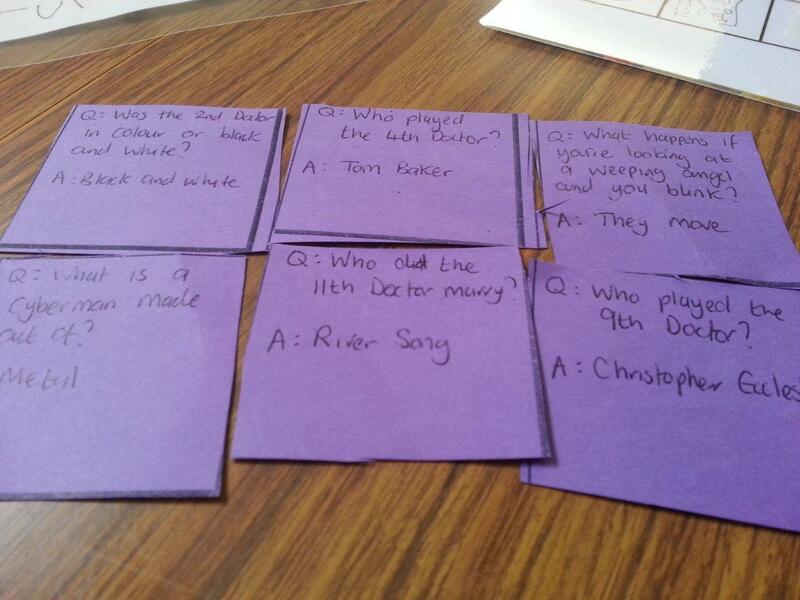 It said Rose Tyler. DOCTOR: Oh, no! Sorry, she’s alive. 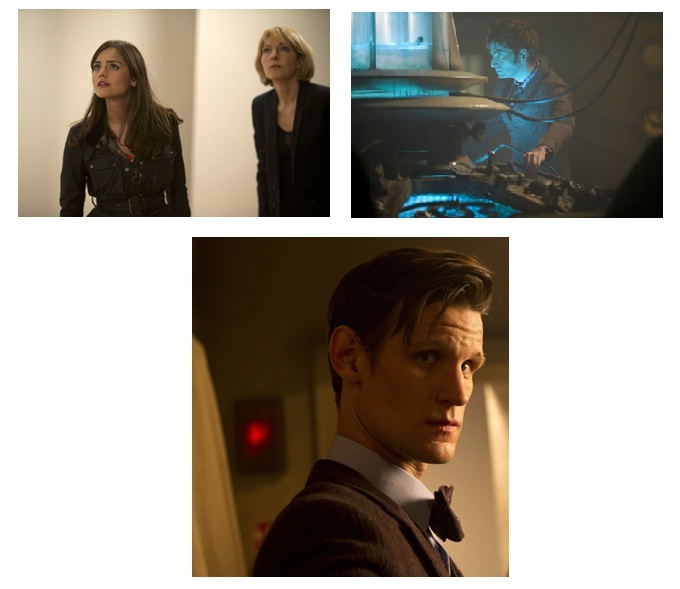 DOCTOR: Parallel world, safe and sound. And Mickey, and her mother. Which works surprisingly well. And, of course, it means that Martha is a crab, which I don’t think anyone would necessarily dispute. It’s as near-as-dammit a recreation as I could manage. Part of the problem is that certain lines of dialogue end on a shot of someone’s head, and it is to that same head that we cut when I paste in the previous line – resulting in an unfortunate twitch as the expression or position of their face changes from one frame to the next. I got round this by interposing shots of Martha, whose role is to stand there silently and look doe-eyed at the Doctor, but there are only so many times you can do that. Still. The idea has potential. This could feasibly be the first in a series. There are other scenes that will work. Probably. I’ll find them, if I read through every transcript. Which I’ll probably do. But at some point I really should finish reading the Hofstadter. I’ve got a sneaking suspicion that I may have altered the URL of my last entry after I’d sent it out, which may well have rendered it inaccessible. 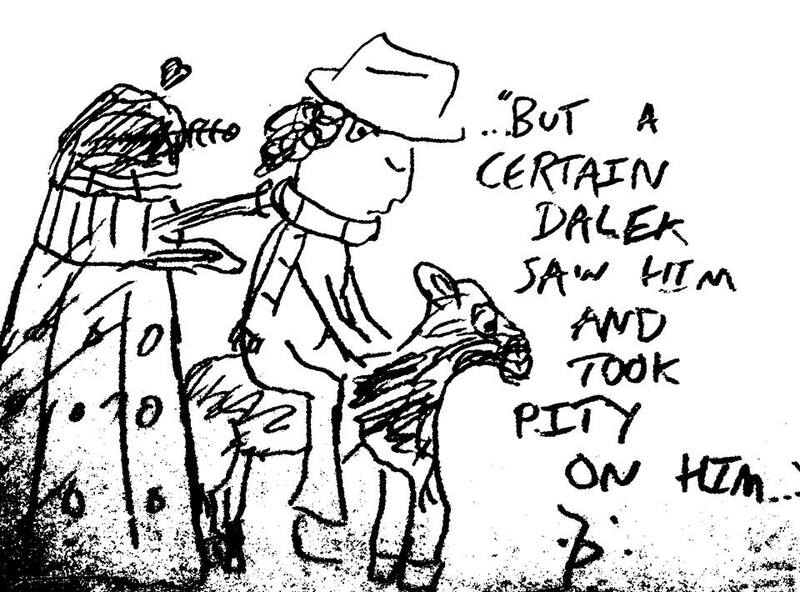 So if you missed out on Dalek Caan talking like Johnny the painter from The Fast Show, here’s the updated link. Unless you’ve been hiding under a rock (waiting for Tom Baker to come and look at you) for the past few days, you’ll know all about the BBC’s recent announcement that they’ve found most of ‘The Web of Fear’ and ‘The Enemy of the World’, two lost gems from the lost archives of the Second Doctor. This rumour has been circulating all year, of course, although the actual size of the haul has decreased from 105 episodes down to about 9 over the months, while the location of discovery has shifted from Ethopia to Nigeria. It would be easy to suggest, rather cynically, that the discovery occurred at the end of winter, the negotiations finished in spring and that the BBC drafted the press release before the summer solstice, and then held off on the announcement until mere weeks before the anniversary story in order to ensure maximum publicity. But I am not going to do that. Honest. Elsewhere, there are the usual grumblings from fans who are complaining about the iTunes release plan. “Some were saying that if lots of people buy those then the BBC might not bother releasing DVDs because no-one will want to buy them twice,” said Gareth. “Others were saying that if too few buy the iTunes (e.g., because they’re waiting for the DVDs) then the BBC might not bother releasing DVDs because there’s clearly no interest. 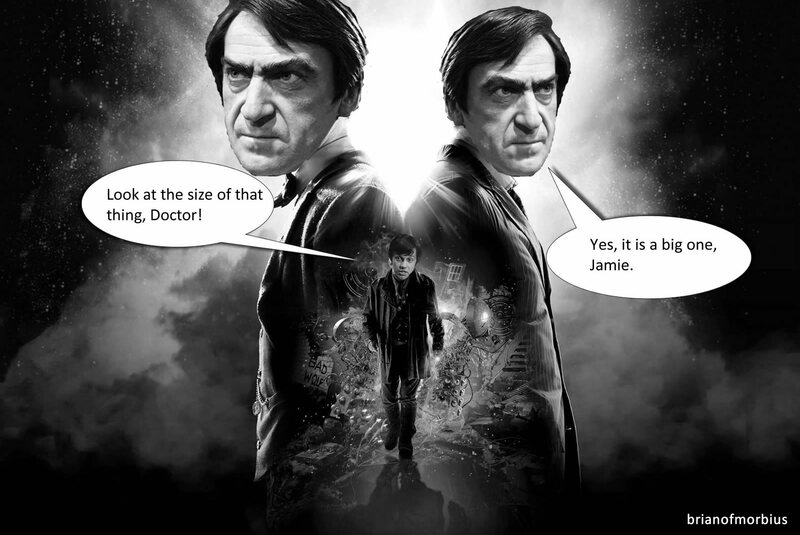 Silly!” Of course, the DVDs of both adventures are due – in November and February – and they will be well received, because you can never have too much of Patrick Troughton. I had an idea a while back for a Doctor Who story in which the Tenth Doctor and Martha are asked by a wise and learned people to travel back in time and recover some sacred scrolls that are vital to their future. The Doctor does this, only to find that the scrolls contain a secret so terrible it must never be revealed, and he takes it upon himself to see it’s destroyed. I know I just said you can never have too much of Patrick Troughton, but I can’t help wondering whether some of these episodes should stay buried. In any event, this whole thing makes me wonder what’ll happen when we eventually stop collecting physical media just consign everything to the cloud. I know that DVDs and Blu Rays don’t last forever, and I know that the servers are hidden in bomb-proof hangars underneath international airports (meaning that in the event of a nuclear apocalypse and the collapse of the global infrastructure, we’ll still be able to watch Doctor Who), but what happens when the terrorists work out a way to wipe out the internet and hold us all to ransom? Would we really be willing to sacrifice our freedom so that the likes of lolcatz can survive? I’m not sure I would, although I might make an exception for rathergood.com, particularly this one. Of course, if we’re being futurist and cynical at the same time, we might end up with something like this. Using one crap episode to exploit another is a bit self-referential, of course, but that’s the story of my life. Today’s entry starts with an If-Then statement, that occurs as a result of this question: Are you, dear reader, familiar with The Fast Show? To some of you that’s going to seem like a dumb question, because you know every Ted and Ralph gag and have been impersonating Jazz Club’s Louis Balfour for nearly two decades. But I’m aware that there’s a whole new generation growing up online who’ve never seen it – and I’m never sure how well it did in America (where it was in any case known as Brilliant). Anyway, if the answer is yes, then you may skip the first of the embedded clips I’ve posted here (unless, of course, you’d like a quick reminder of how funny that lot could be with the right material). If the answer is no, then I strongly recommend you watch both, in order, because otherwise you’re going to get very confused. I can’t work out why no one’s thought to do this one already. It seems like such an obvious joke. Actually, it is an obvious joke, because we were making it back in 2008. 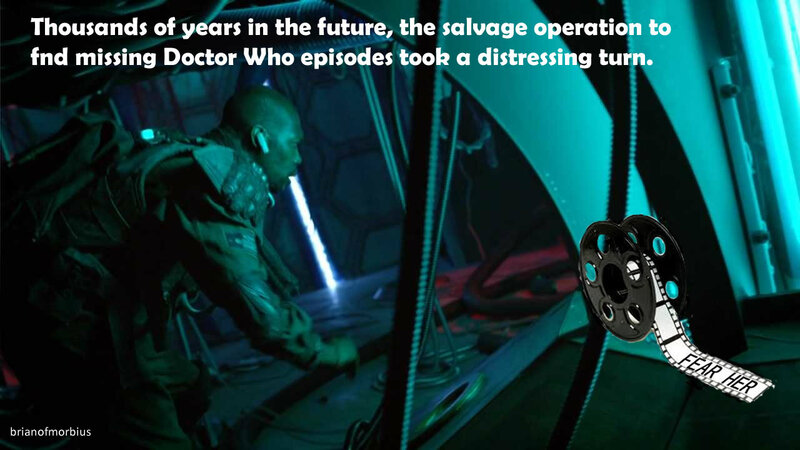 As soon as ‘The Stolen Earth’ had aired, complete with its view of the multi-tentacled, one-eyed ‘insane’ Dalek Caan (resembling the lovechild of Cthulhu and TMNT’s Krang), the internet forums were on fire trying to work out whether the Tenth Doctor might actually be regenerating next week. But sandwiched between all the remarks about Billie Piper’s teeth and whether David Morissey’s Christmas role was going to get an early showing, there was another thread of discussion doing the rounds – doesn’t Dalek Caan sound incredibly like Johny, the manic-depressed artist? Higson and Whitehouse’s oft-imitated sketch show always was a little patchy, of course. On the one hand, it gave us the likes of Denzil Dexter, Ted and Ralph, the Offroaders, Jesse the country bumpkin and Rowley Birkin QC. On the other hand, Chris the Crafty Cockney was irritating to a point, and that Suit You gag wore out its welcome in episode two. It was also far too reliant on catchphrase humour, and spawned a wave of paler imitations. Without The Fast Show there would arguably be no Little Britain, and the world would be a nicer place. But Johnny the Nice Painter was one of my favourites. The payoff to his trigger word – the cry of “Black! Black! Black like a SOUL!” – was wonderful even when you knew it was coming (and in later episodes his wife Katie apparently did, and it was always fun trying to watch her desperately circumnavigate). Higson times his rants to perfection, and Arabella Weir is always nicely understated. We live in sensitive times as far as portrayals of mental health are concerned – recent headlines are testament to that – and it would be interesting to see whether something like this would get the green light today, but even bearing that in mind, Johnny’s condition is too ambiguous to really cause offence. I put this together over three or four evenings – time I really should have spent tidying the house, but if it took longer than usual it’s because I was experimenting a bit. The first thing you’ll note is the ring modulator on Johnny’s voice. It didn’t really work without it, the artist’s tones being slightly too squeaky to really compete with the other layers of sound. Results (thanks to Audacity and a bit of help online) were reasonable, although the modulated laugh track sounded ghastly, so – with unavoidable exceptions – I’ve kept its use to a minimum, splicing in the equivalent spots from the unaltered original. Then I worked with some isolated audio tracks, which enabled me to dip in and out of the dialogue from Davros, the Doctor and the Supreme Dalek without having to worry about score – which I added in later, using cues from earlier series. The result is one of the cleanest edits I’ve produced in a while, certainly the cleanest from anything in the New Who canon. Structuring the thing was a bit of a bind. I still worry that it starts too slowly, but the expository conversation between Davros and the Supreme Dalek felt like the only logical point at which to begin. You needed to have the other characters interjecting, so I isolated as many instances of ‘Dalek Caan’ as I could and then spliced them between Higson’s rambling. 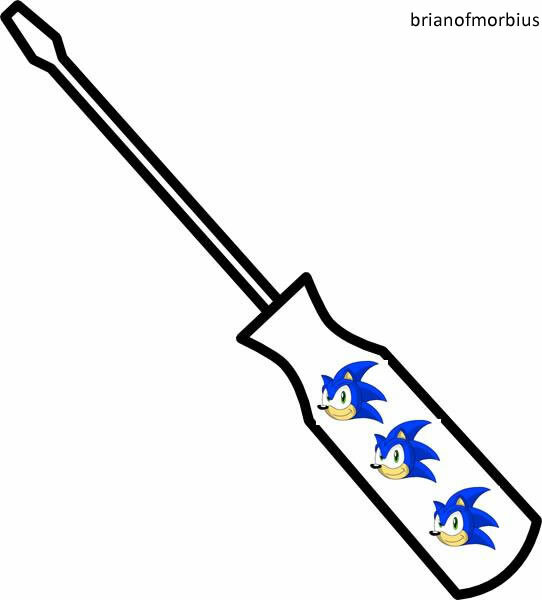 I then had no idea of how to finish the thing, so I blew them all up, because that usually seems to work. I looked around at the cluttered hallway, the unhoovered carpet and the pile of ironing.